This is not November 1985. Everything has changed since then. Changed utterly. All of unionism, across every class, background and political party opposed the Anglo-Irish Agreement. And there was fear; the very real sense that Northern Ireland would tip over the edge. I was in Belfast when the news came through that the AIA had been signed. I attended two hastily arranged meetings and had never before – and have never since – seen so much anger. As one prominent businessman put it, “every unionist from the bin man to the banker is united against this”. A week later there was a huge rally in Belfast city centre – easily the largest since the 1912/14 era; and larger than those at the time of Sunningdale in 1974. All classes were there. Even people who had been reasonably supportive of Sunningdale were there. People who couldn’t stand Ian Paisley’s brand of unionism were there. People who hadn’t bothered voting for years were there. There ... and united in anger. 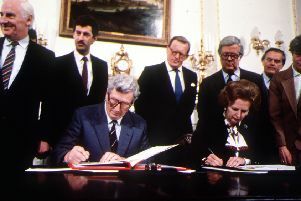 This was still a time when no-one disputed that unionism was – and comfortably so – the majority (49-29 seats in the Assembly and 15-2 in Westminster).This majority felt betrayed by Thatcher – in whom they had placed so much faith. Yet there was no formal arrangement between the UUP and Conservatives; and both Molyneaux and Paisley dismissed rumours, which began emerging in summer of 1985, that she was planning to cut a deal with the Irish. Today, all of unionism is not opposed to the Withdrawal Agreement (WA). A significant minority of voters from the unionist/pro-Union community voted Remain. Opinion poll evidence suggests a shift in the views of some who voted Leave. Key figures – including many from a pro-Union background – in the business, commercial, farming industries et al believe that the DUP should support the WA. More importantly, they are saying so openly. They are very unhappy with the DUP’s stance. I have heard people suggest that unionists here should unite to bring down the WA. In truth the only people who can do that are the 10 DUP MPs. And while it’s true that the parliamentary arithmetic is in their favour and that the agreement is likely (but not guaranteed) to fail, there is no certainty about what they would do afterwards. That’s what worries the business classes: they fear uncertainty and a potential no deal. As for street protests: they’re not going to happen on the scale that would make a difference. The AIA wasn’t ended by protest. The protests over Drumcree and flags didn’t result in major change. Those days have gone. Today, unionists do not represent a majority in the Assembly: down from 49-29 to 40-50; and in Westminster, down from 15-2 to 10-8. Not the sort of figures that would encourage a series of by-elections. But perhaps the most significant difference between November 1985 and November 2018 is the fact that the DUP has a formal pact with the Conservatives. Not just the sort of nod-and-a-wink arrangement that Molyneaux had with John Major at the time of Maaschrict, but a full-blown confidence and supply arrangement. So important was the arrangement that it allowed Foster and other senior DUP figures to boast ‘the Union is secure’. The DUP is both embarrassed and enraged by this betrayal. All the public and private assurances given to them by Mrs May blown out of the water. So, what do they do? They say they will vote against the WA – even if that means bringing down May and the government. That doesn’t necessarily mean another election, but it would probably mean a new leader. Who do they trust more than May? Could they rely upon Johnson, or Raab, or whomever it turns out to be, to back them and stand up for NI? They don’t even have a guarantee that it would be a 100% Leaver takes her place. And if the WA goes to a formal vote in a few weeks – and again much depends on a possible vote of confidence – I am pretty sure that up to two-thirds of Conservative MPs would support it, even with the present provisions on NI. As I noted in last week’s column, ‘the next few weeks will represent the greatest challenge to the DUP since it was founded in 1971’. That challenge is even more stark today, after they have been so deliberately, unambiguously shafted by May and a majority of her Cabinet. Worse, they are also taking criticism from across political/electoral unionism, as well as from those sectors which have most to fear from a bad Brexit deal or no Brexit deal – and that sector cannot be dismissed as anti-Union. Many of them aren’t. That sums up the dilemma for all unionists. My view is that the WA does not pose an immediate or an inevitable threat to the constitutional integrity of the UK. But when we consider the unexpected consequences of both the Good Friday and St Andrews agreements (NI ended up more polarised and the centre ground stood still) only a fool would assume that the WA couldn’t, albeit incrementally, lead to Irish unity. That’s the DUP’s biggest worry in all of this. Nationalists and Remainers in NI want an arrangement that recognises and respects the safeguards they take for granted within the EU; as well as knowing that their specific sense of identity is protected. So it’s no surprise that unionists want a deal which does the same for them. The DUP’s problems today are greater than they were this time last week. As are those of unionists generally. Anger and rhetoric will not solve those problems. If ever there was a time for clarity, certainty and cold-headed thinking from the leadership of unionism, it is right now. Don’t fear the worst. Don’t spook your support base. Don’t favour the rash statement over the considered strategy and suggestion. This is not the beginning of the end: so don’t act as though it were.